In February, upmarket Canadian meat purveyor, Greenfield Natural Meat Co, kicked off a Meatless Monday campaign. A butcher encouraging customers to forgo meat on Mondays? What’s going on here? The UK market research consultancy, TrendWatching, offers these perspectives…. Greenfield’s campaign cites the harmful environmental impact of meat production. As well as encouraging customers to share their pledge on social media, the company covers up product photos of its meat on its website every Monday. This is the new marketing landscape, says TrendWatching: “Next time your colleagues or clients shoot down an idea for being too risky or simply ‘not possible’ then show them this. 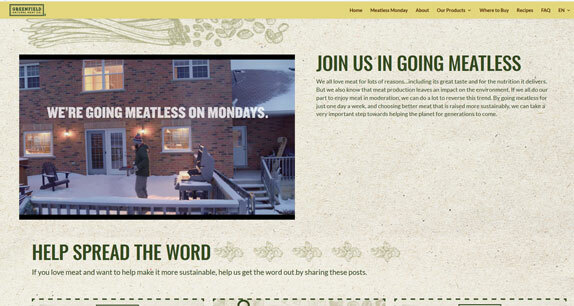 A meat producer promoting Meatless Mondays. “Or show them other recently featured campaigns such as Philip Morris’ anti-smoking ad, or Diesel’s ‘authentic knock-off’ store. Or any number of examples right back to Patagonia’s famous ‘Don’t Buy This Jacket’ Black Friday campaign. “Two takeaways. First, if you know there’s a wider issue facing your brand or industry, confront it head on. Support your customers, don’t fight them!